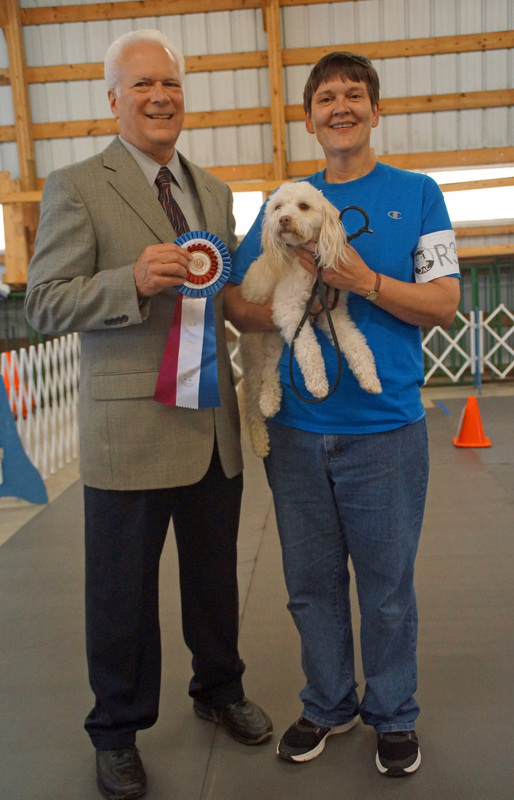 Finley of South Washington earned his Rally Novice A title at the KCKC 2016 All Breed Dog Shows. Finley has come a long way since his adoption in September 2014. Finley, a little Bichon Poodle mix, was a stray puppy roaming the streets of Chicago. After weeks in the Chicago impound facility with a broken right rear leg, he was released to One of a Kind Pet Rescue in August 2014. I had a huge void in my life after my beloved fifteen year old dog Bailey passed. Finley's photo spoke to me. He needed a good home. I knew I could give Finley the home he deserved. I applied to adopt him. After OOAKPR checked my references and did a home check, I met Finley and his foster Mom in Elysian. I brought him to his "fur-ever" home in New Ulm. Finley needed time to adjust, learn, build trust and experience what a dog's life could be in a home where he was wanted and loved. This took some time, lots of patience and much help from other dog people. Finley and I took an Obedience Class at KCKC. The instructors recommended we give Rally a try. My intention was never to have Finley compete. Attending Rally would give Finley a chance to work on socialization with dogs and people. I guess I should “Never say NEVER”! With the help, support, and encouragement of our instructor Gladys, Finley and I decided to give Rally competition a try. We became members of AKC Canine Partners. Finley could not be registered as just “Finley," so I thought it would be appropriate to add the name of the street where he lives. It truly has taken our entire neighborhood, friends, family, and members of Puppy Love Therapy Dogs to help Finley become a rescue dog success story. Finley earned his first Rally qualifying score at the Bloomington Obedience Training Club in November 2015. He received his second and third qualifying scores and earned his Rally Novice A title at the recent KCKC shows. We plan to continue Rally. Finley and I became a registered Alliance Therapy Dog (ATD) team in August 2015. We are members of Puppy Love Therapy Dogs, Inc. and have made fifteen visits. Finley especially enjoys the pet safety visits with second graders. Finley has come a long way since his adoption in September 2014. Who knows what might yet be added to Finley’s story?